Happy Monday! I’m not going to lie, I have been anxiously awaiting Mondays now because I’m excited to connect with you here in this space. It’s helps a little with the Monday blues. :) This week and next, I am going to be sharing about my branding journey. If you are considering investing in a designer for your website and brand, I hope todays post will be helpful to you! When I first decided to start Sincerely Amy Designs in June, I had high hopes of creating my own website and brand. Squarespace was fairly easy to navigate and I understood the basics of Illustrator. However, I quickly learned that creating a website and brand for yourself is HARD. I felt unsure of what I really wanted and my lack of knowledge and experience was making it difficult to execute some of my ideas. Taking the step to hire Lauren from Elle and Company, to come alongside me in building my brand, was scary! I was putting my dream in her hands, along with a good amount of money. Today, I wanted to talk a bit about my experience with Lauren by sharing 5 things hiring a professional designer did for me and my brand - a few I expected going into the process and a few surprised me along the way. Trying to navigate the waters of building a website was incredibly time consuming. I was struggling to find adequate time to sit down and get it all done. I was beginning to feel like I needed to turn down paying calligraphy jobs so I could get it finished. Time became one of the biggest motivators for me in hiring a designer. It opened up my schedule to allow me to continue to do what I do best, calligraphy - not website/brand design. With working a full time job during the day, running the calligraphy business, and the responsibilities that come along with taking care of my grandma, my time is limited and has become increasingly more valuable to me. It was amazing to watch Lauren do in one day what would have taken me weeks to do on my own. It felt like a weight was lifted off my shoulders every time she took on a task for my brand that, before I hired her, I had been dreading or struggling through. One of the things that came as a surprise in this process was that working with a designer widened the audience I was reaching. It’s no secret that Elle and Company is gaining a lot of momentum right now. I found that every time Lauren posted about my brand, I would gain a large number of new followers. I received quite a few comments and emails once the site launched, telling me they had found my site through Elle and Company and were excited to continue to follow my business! These are people and potential clients that I would not have likely reached had I decided to do it all alone. While I didn’t realize it at the time, booking Lauren ended up being a very strategic move for my business. I remember being so overwhelmed at the idea of creating a Pinterest board for Sincerely Amy Designs. All the different pins I had felt like a chaotic disaster. I apologized to Lauren on many occasions for my Pinterest board haha. When she first sent me my inspiration board that she had designed, from what seemed like a mess of pins I had given her, I cried. She had nailed it. With her outside perspective, and design eye, she could see past what I just viewed as pretty images. She was able to pin point the similarities and trends to my choices. In the beginning, I thought I had no idea what I wanted, from design colors all the way to an ideal client. With intentional questions and a fresh set of eyes, she was able to help me put to words and design what I wanted Sincerely Amy Designs to look like and be about. So much clarity can come from hashing out your thoughts and ideas with someone else and I found that to be the case over and over again as I worked with Lauren. When working on my brand alone, I was highly underestimating the value of an outsider's perspective. Another reason I initially decided to hire a professional designer was because I didn’t trust myself to come up with something original. I was feeling some what tired of seeing the same designs and color schemes over and over again. It wasn’t that I didn’t like those designs, it was just that I wanted something that made me different and stand out from the crowd. Hiring a professional meant I was working with someone who not only knew how to bring the designs to life, but also knew the "whys" behind design decisions. For example, Lauren knew what colors to choose when thinking about reaching my ideal client, an aspect I would have never considered. Her experience and expertise allowed her to create something original. Being in an industry that is booming, with new businesses hopping on board every day, I knew it was important that my brand look different. And as an added bonus, I gained so much knowledge about design in the process! I knew that having a professional looking site would allow me to increase my prices. However, what I didn't predict was the increase in inquires and sales. That may have been a silly oversight on my part but I was viewing my website mainly as a way to educate clients, through the pricing, process, styles, and envelope etiquette pages. I am only a week and a half into having a home on the internet for Sincerely Amy Designs and the new sales alone have already covered the cost of hiring a designer. I am fully aware of the crazy blessing that is and I do not take it for granted! I had no idea just how pivotal of a decision I was making for my business when I hired a designer. I have been absolutely shocked at the results I’ve seen from having a professionally and intentionally designed brand. It's been an exciting few weeks! With that said though, I understand completely how big of a step it can be to put your business, along with your hard earned money, into someone else's hands. If I can help answer any questions you might have about the branding process or specifically about working with Elle and Company, please leave a comment below or feel free to email me! Wow! I was, and still am, completely blown away at the response to the website launch this past Thursday! It was a day I will not quickly forget! I stayed up through the night Wednesday until the site launched at 6 am on Thursday, finishing little odds and ends on the site and figuring out how blogging worked on Squarespace (Thanks, Lauren for the helpful webinar on blogging!) I can't even remember the last time I pulled a legit all nighter. One thing is for sure, I'm too old to do that again! I have to take a second to give a quick shout out to my friend, Laura. As I said on Thursday, God has made himself so prevalent through this entire process, even in the littlest details. It was no different Wednesday night, hours before the launch. Laura, who is one of the most talented writers I know, and whose opinion I highly trust, happened to have insomnia Wednesday night. While that usually isn't a good thing, in this case, I was SO grateful. When she logged on to gchat to tell me she wasn't able to sleep, I knew God was keeping her up so that I wasn't alone. She calmed my nerves, made sure my blog post was coherent, and promised me people would NOT be disappointed. While the sky was still dark, I pressed the live button at 5:30 am and we threw an emoji party! God knew better than I did just how much I needed someone to be awake with me through those final hours. Thursday morning came and I was more exhausted than I have been in years, but your excitement gave me the adrenaline I needed to get through the day (along with a triple shot white mocha from Starbucks). I do not have the words to adequately thank you for every single visit to the site, comment, share, like, text, email, and gift. I felt so loved and supported. My heart almost couldn't take it! THANK YOU for being a part of this dream and for celebrating with me! I want to take a moment to let you know what to expect from this little blog from here on out. I wish I could blog every day and I have so much content I can not wait to share, however I am in a season of life where blogging every day is just not realistic. I currently work full time as a nanny to 4 great kids, my husband is in school full time as an Electrical Engineering student, and we live with and take care of my aging grandma. I am learning that as much as I want to, I just can't do it all. The perfectionist in me is always tempted to try and then this nice little thing called "burn out" reminds me that I can't. I've been dreaming up content for a blog long before Sincerely Amy was even in existence but I know, for now, I need to take it slow. While I can not blog every day during this season, I want to at least blog consistently. So, when will you hear from me on the blog? You can expect to find a new blog post every Monday. And what can you expect to see here? I plan to have posts about this small business journey and what I'm learning in the process, posts with tips and tricks for lettering and calligraphy, posts about my faith, and posts with beautiful images showcasing some of the projects I'm working on. I am already looking forward to our time together on Mondays and I hope you'll check back each week! Next week, I'll be starting a mini series on the branding process and what I have learned from it. I'd love to know, though, what would YOU like to see here on the blog? Leave a comment and let me know! I hope this is a place where we can learn, grow, laugh and build community together. Don't Forget! You have until 11:59 TONIGHT to get entered into the launch day giveaway! Head back one post to enter. If you love prints, journals, flowers, and/or Paper Source, you aren't going to want to miss it! Friends, I can’t believe it’s finally here! Is this real life? I’m not even sure. With a lot of tears and a heart full of joy, I want to say, “Welcome!” I’m SO glad you are here and I’m excited to share this space with you! This has been a crazy ride, starting a business. While this new branding and website has been in the works for months, this dream has been around for much, much longer. I wish I could sit down with each of you, over a cup of coffee, and share all the intricate details of God's faithfulness and hand in all of it. This isn't just about calligraphy. This isn't just about pretty letters. This isn't just about a business or making money. This is about a journey and a story: His story - that by God's grace I am allowed to be a part of. And He’s writing a story that’s more beautiful than I could have ever imagined. I will never forget the day I decided to go for it. Nine months ago I was sitting at Chick-fil-a having lunch when I got a message from Alicia, our wedding photographer. She asked if I was going to turn my calligraphy into a business and if so, she wanted to help. Those words were a game changer for me! Alicia gave me the courage to vocalize something I had kept between God and myself for so long. Tears streamed down my face and it was then and there that I chose to say “Yes - I’m doing this!” (And I’d be lying if I said I didn’t have a mouthful of waffle fries while all of this was going down. Who can resist those fries?) She had no idea the prayers she had just answered with that simple message. She presented me with my first client within the hour, and there has been no looking back ever since. I have felt God’s goodness over and over again as so many people have been incredibly generous with their time, talents, wisdom, and encouragement as I wade this small business adventure. They've all been important pieces of this story. Where would this brand be without Lauren (Elle and Company) and Andrea (Andrea Pesce Photography)? It wouldn’t be here; that’s for sure! I’m pretty convinced they know me better than I know myself. Stay tuned because I’ll be highlighting my experience with both of them in upcoming posts. While Lauren and Andrea are a huge part of what you see here, there are so many people behind the scenes that have played important roles in Sincerely Amy Designs. I’ve already mentioned Alicia (Alicia White Photography) above, but who could have ever imagined 4 years ago, when we booked her to shoot our wedding, that she would play such a vital role in making today a reality. It’s those beautiful details that only God can weave when He’s the writer of your story. Shannon (Shannon Joy Paperie) and Kat (Dear Sweetheart Events) were the first two people I contacted when I was finally ready to say the words, “I’m starting a calligraphy business!” It was the scariest two emails I’ve ever sent but their responses are two of the sweetest emails I’ve ever received. Their encouragement and advice along the way have been priceless. Laura (Blog Around the Corner), whose friendship has been more valuable than I can put into words, has been my right hand man in this process, from getting the first sneak at the inspiration board and logo, helping with outfit choices for photos, to telling me I needed to rest and step back for a bit. And then there is my husband, my poor, poor husband. He had no idea what he was doing when he bought me a calligraphy starter kit a few years back for Christmas. While I think he probably never wants to hear another word about ink, paper, nibs, branding, or starting a business, he’s been crazy supportive of me chasing this dream. He’s had to put up with so many late nights, busy weekends, and the roller coaster of emotions owning a small business takes you on. Never once has he suggested I give up. Owning a small business is not a journey you can or should travel alone and I feel so thankful for the community that has and continues to support me. Thank you, from the bottom of my heart, for following along and being a part of this story. It is my prayer when you are here that you will find courage to live your unique story - a story that only you can fulfill. You have a calling and a purpose and the world will be different when you are living in that calling. I hope you will also find this little piece of the World Wide Web to be beautiful, inviting and comfortable. (After all, I am writing this from my bed, in my sweatpants!) Stay awhile, take a look around and then join in the celebration with the amazing giveaway below! 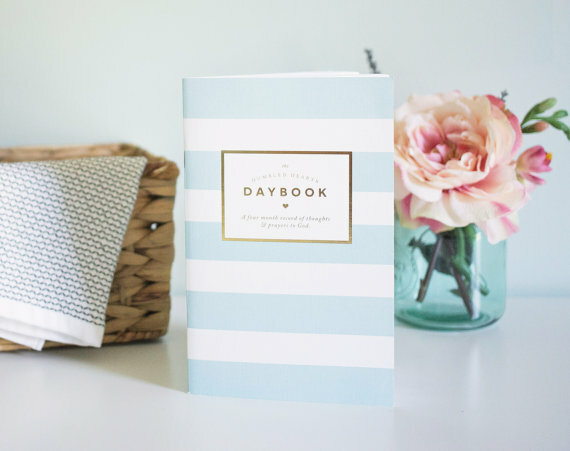 Daybook Prayer Journal from Hazel Berry Design Co. There are a lot of ways to be entered into the giveaway! Use the rafflecopter below to find out how to enter. The giveaway will end Monday, March 16th and 11:59pm.